I need to take a C++ vector with potentially a lot of elements, erase duplicates, and sort it. I currently have the below code, but it doesn't work. How can I correctly do this? Additionally, is it faster to erase the duplicates first (similar to coded above) or perform the sort first? If I do perform the sort first, is it guaranteed to remain sorted after std::unique is executed? Or is there another (perhaps more efficient) way to do all this? I agree with R. Pate and Todd Gardner; a std::set might be a good idea here. Even if you're stuck using vectors, if you have enough duplicates, you might be better off creating a set to do the dirty work. Summary: when the number of duplicates is large enough, it's actually faster to convert to a set and then dump the data back into a vector. And for some reason, doing the set conversion manually seems to be faster than using the set constructor -- at least on the toy random data that I used. I redid Nate Kohl's profiling and got different results. For my test case, directly sorting the vector is always more efficient than using a set. I added a new more efficient method, using an unordered_set. I did some digging inside the set and unordered_set implementation and discovered that the constructor actually construct a new node for every element, before checking its value to determine if it should actually be inserted (in Visual Studio implementation, at least). std::unique only removes duplicate elements if they're neighbours: you have to sort the vector first before it will work as you intend. std::unique is defined to be stable, so the vector will still be sorted after running unique on it. Otherwise, sorting prior to calling unique (as the other answers pointed out) is the way to go. std::unique only works on consecutive runs of duplicate elements, so you'd better sort first. However, it is stable, so your vector will remain sorted. You need to sort it before you call unique because unique only removes duplicates that are next to each other. Efficiency is a complicated concept. There's time vs. space considerations, as well as general measurements (where you only get vague answers such as O(n)) vs. specific ones (e.g. bubble sort can be much faster than quicksort, depending on input characteristics). If you have relatively few duplicates, then sort followed by unique and erase seems the way to go. If you had relatively many duplicates, creating a set from the vector and letting it do the heavy lifting could easily beat it. Don't just concentrate on time efficiency either. Sort+unique+erase operates in O(1) space, while the set construction operates in O(n) space. And neither directly lends itself to a map-reduce parallelization (for really huge datasets). unique only removes consecutive duplicate elements (which is necessary for it to run in linear time), so you should perform the sort first. It will remain sorted after the call to unique. As already stated, unique requires a sorted container. Additionally, unique doesn't actually remove elements from the container. Instead, they are copied to the end, unique returns an iterator pointing to the first such duplicate element, and you are expected to call erase to actually remove the elements. doesn't work for a vector of pointers. Look carefully at this example on cplusplus.com. In their example, the "so called duplicates" moved to the end are actually shown as ? (undefined values), because those "so called duplicates" are SOMETIMES "extra elements" and SOMETIMES there are "missing elements" that were in the original vector. A problem occurs when using std::unique() on a vector of pointers to objects (memory leaks, bad read of data from HEAP, duplicate frees, which cause segmentation faults, etc). Here's my solution to the problem: replace std::unique() with ptgi::unique(). // Fix a problem in std::unique(), such that none of the original elts in the collection are lost or duplicate. // There is the 2 argument version which calls the default operator== to compare elements. // There is the 3 argument version, which you can pass a user defined functor for specialized comparison. // in the collection, nor does it create duplicates. // except that duplicates have been moved to a contiguous range [dupPosition, last) at the end. //  [begin, dupPosition) range are unique elements. //  [dupPosition, last) range are duplicates which can be removed. // In the original std::unique() non-duplicates at end are moved downward toward beginning. // In the improved ptgi:unique(), non-duplicates at end are swapped with duplicates near beginning. // but ptgi::unique() won't. Use valgrind(1) to find such memory leak problems!!! // Example of differences between std::unique() vs ptgi::unique(). //  // given an int data array, remove consecutive duplicates from it. //  // Two numbers equal if, when divided by 10 (integer division), the quotients are the same. //  // Hence 50..59 are equal, 60..69 are equal, etc. //      PROBLEM: 11 is lost, and extra 21 has been added. //      Problem: 21 and 22 are deleted. //      Problem: 11 and 23 are duplicated. //  Remember we "remove adjacent duplicates". //  In this example, the input is NOT fully sorted when ptgi:unique() is called. //  In example above, 20, 21, 22 are "same" since dividing by 10 gives 2 quotient. //  And 30,31 are "same", since /10 quotient is 3. //  And 23, 24 are same, since /10 quotient is 2. //  And 11 is "group of one" by itself. //  Now we hits the "optimized out swap logic". // 1) the #ifdef IMPROVED_STD_UNIQUE_ALGORITHM documents how we have modified the original std::unique(). // 2) I've heavily unit tested this code, including using valgrind(1), and it is *believed* to be 100% defect-free. // Created to solve memory leak problems when calling std::unique() on a vector<Route*>. // Memory leaks discovered with valgrind and unitTesting. // vector contents, to avoid memory leaks and duplicate pointers in vector<Object*>. #error the #ifdef for IMPROVED_STD_UNIQUE_ALGORITHM was defined previously.. Something is wrong. // memory leaks, when vector contains pointers. // Normally the input is sorted. // Now GONE: c, d.
// Now DUPS: g, i. // This causes memory leaks and segmenation faults due to duplicate deletes of same pointer! // Return the position of the first in range of duplicates moved to end of vector. // @param [first, last) is a range to find duplicates within. // IF all items are unique, then it would return last. // the first iterator moves over all elements [begin+1, end). // element pointed to by *first. At that time, we swap them. //          THIS IS WHAT WE WANT TO DO. //          BUT THIS COULD SWAP AN ELEMENT WITH ITSELF, UNCECESSARILY!!! // and uncessarily moves in place! // in the equal_to Predicate. I'm not sure how to correctly resolve that issue. // from both a vector<Integer> (test1()) and vector<Integer*> (test2). // Run this with valgrind(1). // And if we run valgrind we seen various error about "read errors", "mismatched free", "definitely lost", etc. // But once we replace the call in test2() to use ptgi::unique(), all valgrind() error messages disappear. // Integer is small "wrapper class" around a primitive int. // There is no SETTER, so Integer's are IMMUTABLE, just like in JAVA. // default CTOR: "Integer zero;"
// COMPRENSIVE CTOR:  "Integer five(5);"
//  std::cout << five.getNum() << "\n"
//  std::cout << five.toString() << "\n"
// Two numbers equal if, when divided by 10 (integer division), the quotients are the same. // Hence 50..59 are equal, 60..69 are equal, etc. // NB: the Integer*& looks funny to me! // how we eliminate the duplicate Integer objects stored in the heap. // I THINK we want to use new C++11 cbegin() and cend(),since the equal_to predicate is passed "Integer *&"
// DID NOT COMPILE when equal_to predicate declared "Integer*& arg1, Integer*&  arg2"
// okay when equal_to predicate declared "Integer* arg1, Integer*  arg2"
//@ print to stdout the string: "info_msg: num1, num2, .... numN\n"
// use const iterator and const range! About alexK7 benchmarks. I tried them and got similar results, but when the range of values is 1 million the cases using std::sort (f1) and using std::unordered_set (f5) produce similar time. When the range of values is 10 million f1 is faster than f5. Here's the example of the duplicate delete problem that occurs with std::unique(). On a LINUX machine, the program crashes. Read the comments for details. 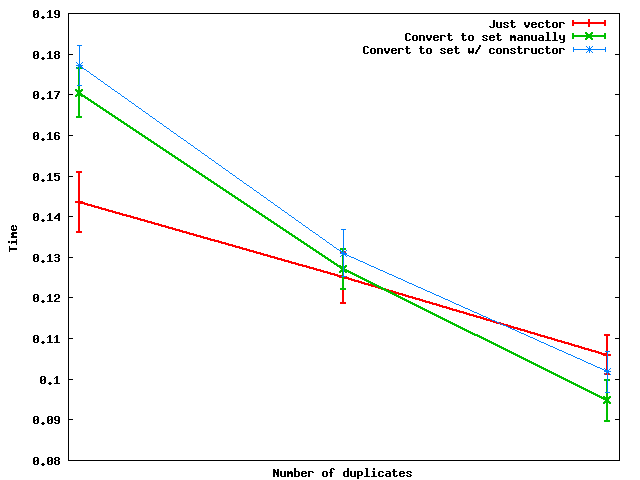 // Illustration of duplicate delete and memory leak in a vector<int*> after calling std::unique. // On a LINUX machine, it crashes the progam because of the duplicate delete. // on all int* poitners to avoid memory leaks. // NOW IF you replace std::unique() with ptgi::unique(), all of the the problems disappear. // the INPUT are STILL in the OUTPUT. // now we delete 3 twice, and we have a memory leak because 2B is not deleted. // from "const char *" to std::string conversion. If you are looking for performance and using std::vector, I recommend the one that this documentation link provides. const auto& it = std::unique (myvector.begin(), myvector.end());   // 10 20 30 ?  ? ?  ? ?  ? I make some experiments and it's faster. This is a function that I created that you can use to delete repeats. The header files needed are just <iostream> and <vector>. Not the answer you're looking for? Browse other questions tagged c++ sorting vector stl duplicates or ask your own question. How to remove duplicates from unsorted std::vector while keeping the original ordering using algorithms? How can I remove duplicate values from a list in c++? How to keep only duplicates efficiently? how can I correctly apply the erase remove idiom on a sorted vector? efficient union of n sorted arrays in C++ (set vs vector)?